When I come home from a long day of work I get giddy when I see the red Loved With Food Box sitting in front of my apartment door. Or well this month it was down by the mail boxes, either way it makes me happy knowing that my one little box helped feed a hungry child. One box = one meal, and that one meal makes the difference in the life of a hungry child. I will never stop my Love With Food subscription for that very reason. Stopping the box means taking a meal away from a hungry American Child. 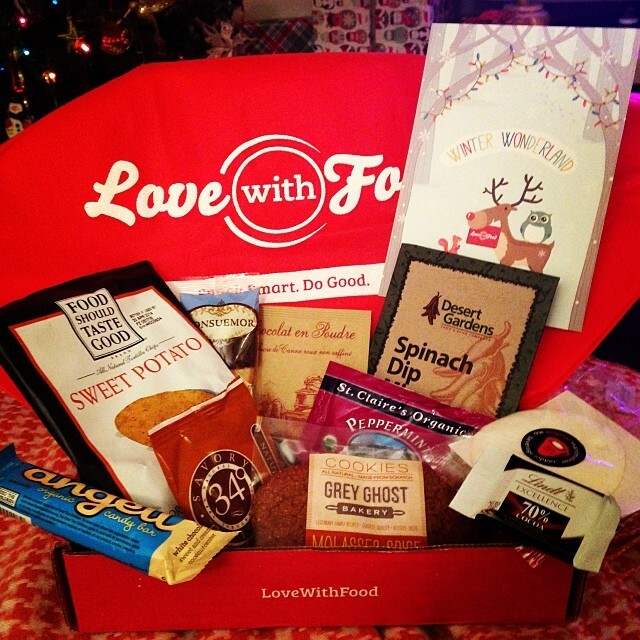 I love the fact that Love With Food puts a lot of thought into the items that they choose for the box. Each item blends into the next and each one fits the theme perfectly. My box was truly filled with treats that would make any Winter Wonderland day enjoyable. “So What did I get in my Love With Food Box?” Oh! I am so glad you asked! Let’s find out! ———————————> This was awesome! As a lover of all things white chocolate, this candy bar was by far hands down the best one of all. It had two of my favorite things white chocolate and coconut. Excellence 70% Chocolate Diamond from Lindt & Spriingi: A full-bodied chocolate that is smooth and rich. ——————————–> Sad but true story “I AmandaJean am deathly allergic to chocolate.” So my Dad took the bullet and tried it for me. He really liked the rich flavor of the chocolate. —————————–> The mints really don’t scream “Winter Wonderland!” However my Dad once again played test dummy and tried the breath mints. He thought they were good. All Natural Marshmallow Topper, Maddy Melts, from Madyson’s Marshmallows: Handmade with cane sugar, real vanilla and kosher gelatin makes this the perfect topper for hot chocolate or to eat as a snack. ——————————> The marshmallow was quite tasty, I really liked it and it went perfectly with a cup of hot white chocolate. I will surely buy a pack of these disc shaped marshmallows. ——————————> Since half of this was covered in chocolate my Dad deemed it unsafe for me and he gladly ate it. Again he said it was pretty good. All- Natural Powdered Drinking Chocolate from Les Confitures al` Ancienne:Raw cane sugar, bourbon vanilla, and the finest cocoa beans are blended to make this luxurious French drink. Natural Crispbread Crackers from 34 Degrees: These wafer-thin crisps are the perfect pairing for holiday appetizers both savory and sweet. Molasses Spice Cookies from Gray Ghost Bakery: Molasses, ginger, and vanilla round out this chewy classic cookie. ———————————-> I have been dreaming about this cookie since Love With Food announced that it would be included in our boxes in a speak peek email. I know a good molasses cookie when I see one and this, this one blew my mind. I ordered more. More cookies = a very happy tummy. Spinach Dip Mix from Desert Gardens: Fresh and flavorful and according to the directions easy to prepare. ————————–> I handed this off to my vegetable loving BFF Sherri. Spinach and AJ do not get along. In addition to the really great treats Love With Food included a red reusable shopping bag as a gift. I will definitely be putting the bag to good use. I am really happy with the assortment I received this month and I cannot wait for January’s box. Each box just keeps on getting better and better. It’s so much fun trying and learning about new organic/natural snacks. There is such a huge selection now days and I feel that Love With Food picks the best of the bunch to put in their boxes.